Ornamental grasses can be an important addition to your landscape, since they are deer-resistant (as well as groundhog, bunny etc resistant), not too hard to locate in the nursery trade and provide multi-season interest. You can find grass species that are tall, spiky, soft, clump-formers, spreaders, some with colored foliage, some with variegated foliage, and so on. They are fairly easy to take care of, as long as you have a good set of loppers to cut some of the larger ones back as they grow bigger. Ornamental grass can function as an exclamation point in the design. Ornamental grasses are the matrix in a matrix planting. Ornamental grass for winter interest. Ornamental grasses have deep roots, which promote healthy soil. 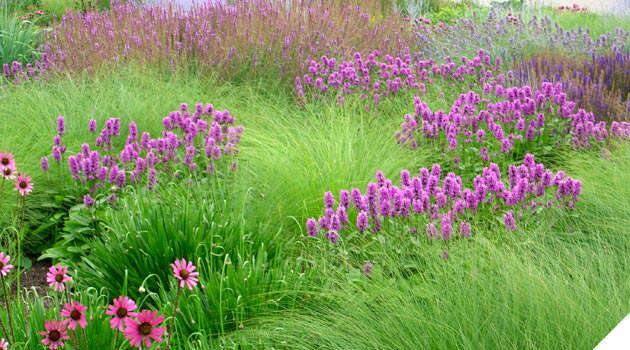 To be more successful, your grass garden should have a mixture of cool-season and warm-season ornamental grasses. 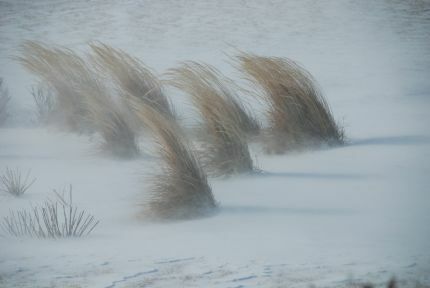 Cool season grasses thrive when temperatures are between 60 - 75 degrees F. They start to grow in early spring and may remain semi-evergreen over the winter. They’re happy again in late fall, but in the heat of the summer they tend to go dormant and may even brown-out - something to consider as far as placement within the planted border. Warm-season grasses don’t even break dormancy until the ground temperature is above 65, and thrive when temperatures are between 80 - 95 degrees F. So warm season grasses are late starters - especially in some of the cool springs we’ve had recently. If the warm-season grasses are just sitting there doing nothing, your matrix planting may look empty and not make much sense until summer. If you include both types of ornamental grasses, you’ll have fresh new grasses in the spring as well as mature grasses and grass flowers in the summer and fall. Briza media, Calamagrostis x acutiflora ‘Karl Foerster’, Calamagrostis canadensis, Chasmanthium latifolium, Deschampsia caespitosa, Deschampsia flexuosa, Elymus spp., All Fescues, Helictotrichon sempervirens, Molinia, Nasella tenuissima, Sesleria spp., Stipa spp. Dynamic, i.e., changing over time"
Similar thoughts have been voiced by a number of other "ecological" landscape designers recently in books and interviews that I've read and in lectures at NYBG, including Claudia West, Thomas Rainer, Roy Diblik, Cassian Schmidt and Patrick Cullina. This is the challenge we face as garden makers in 2018 - to capture all of these qualities in our plantings and to do it "well". Everyone agrees that part of "doing it well" means having a real understanding of the plants you're using - to quote/paraphrase Roy Diblik from his lecture at NYBG earlier this winter, you have to use "plant-driven thought"- understand what a plant wants to do and where it wants to be so it can thrive and how fast it grows and how it spreads and so forth. I feel its important to keep your plant palette broad - not that you have to jam tons of different plants into every design, but that you have to understand a reasonably broad range of plants so that each garden is fresh and each new idea is fresh, even though the general "ecological approach" is the same. Part of Darrel Morrison's Gardens at the BBG - North Entrance "Pine Barrens"
Ecological Soundness grows out of the selection of appropriate plant species and placing them in the micro-environment where they will thrive without the importation of resources such as irrigation water and chemical fertilizers. …They in turn serve a variety of functions, ranging from controlling erosion to providing habitat for birds, butterflies, bumblebees and other pollinators …"
Experiential Richness emerges from the presence of a diversity of plant species and associated fauna, in compositions that are rich in color, texture and movement. " Two other characteristics of the environment that provide a dynamic quality are LIGHT and MOVEMENT. The color of natural light changes as a day progresses, and the physical movement of the plants (and the fauna that are attracted to them bring life to them.) I never tire of seeing the wave-like motion of tall grasses in the landscape, or of seeing (and sometimes hearing) birds, butterflies, and bumblebees moving through a landscape. The direction of light changes throughout a day and a year as well. We can place plants in a designed landscape where they will, during some part of the day, be backlit, literally making them "glow," or as landscape architect A. E. Bye expressed it in a 1967 essay in Landscape Architecture Magazine, they exhibit "luminosity."" He alludes to the four "characteristics of landscapes that people find engaging and attractive. These are (1) mystery, (2) complexity, (3) coherence, and (4) legibility." Mystery is derived from spatial form which unfolds sequentially as one moves through the landscape, revealing landscape spaces. Mystery implies that part of the scene is hidden, thus motivating people to want to see what is "around the bend." Complexity relates to the biotic diversity in a landscape and the aesthetic characteristics which come with this diversity - e.g., colors, textures, and movement. Coherence results from the fact that the distribution of species exhibits perceptible pattern. The tendency of many species being aggregated to a degree, leads to the occurrence of directional "drifts" of color and texture. Legibility … relates to people's ability to "read" how they will move through the landscape, not feeling claustrophobic or disoriented. For "sense of place": "We are increasingly surrounded by generic landscapes, whether it is the sprawling big box stores repeated over and over in suburban environments, or landscapes that are increasingly alike, with the same, limited number of species replacing the natural diversity that may have once occurred there. 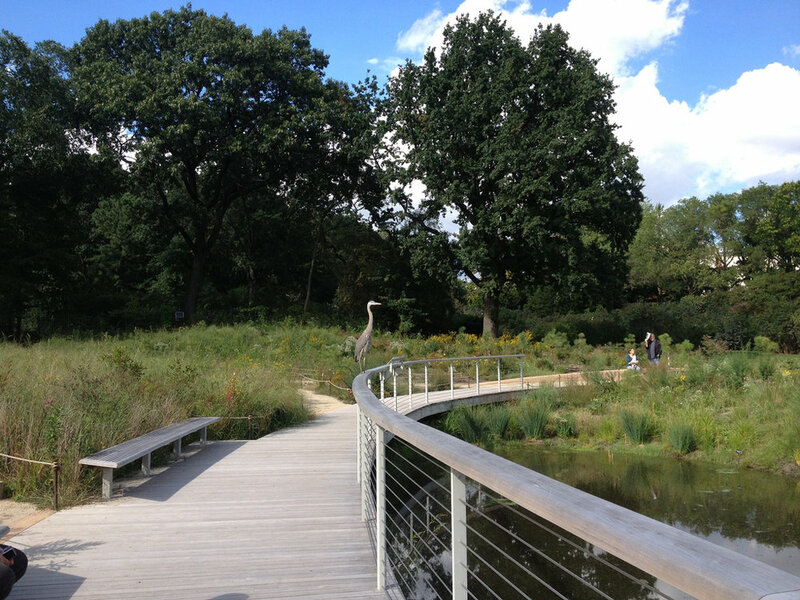 … We can reverse the trend toward "placelessness" by incorporating an array of locally native species which provide cues and clues as to where we are." Dynamic - the created landscape changes over time: "…Landscapes have the potential to be four-dimensional art, with time being the fourth dimension. This is because ecology-based designs are not frozen in time, but are always are evolving, with seasonal changes, growth of individual plants, and in some cases migration of species within the composition. The landscape we see in May is different from the one we see in July, or October, or December. And the landscape we see in 2018 is not the landscape we will see in 2028 or 2048. Hence, there is always something new to discover." 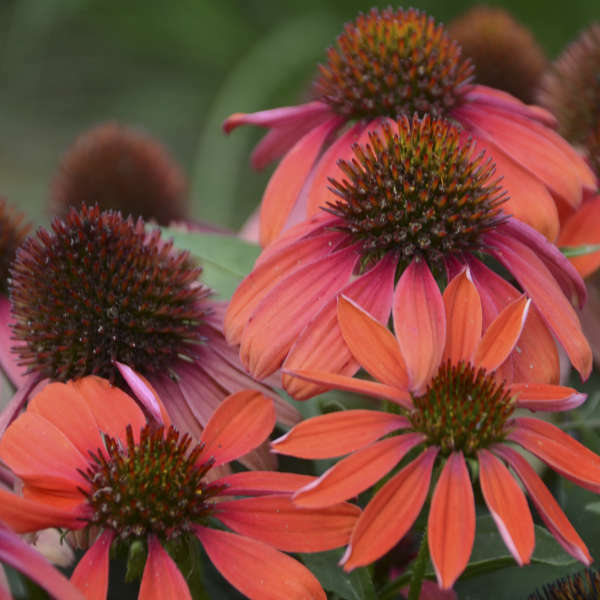 Words to live by - "there is always something new to discover"
Best drought tolerant perennial: Echinacea Lakota 'Santa Fe' (its grown from seed, so it has slight color variations) flowers profusely in shades of red and orange. Its a good performer in both containers and landscape. Grows 12 - 16" tall. Best heat-tolerant perennial: Sedum Rock 'N Grow 'Popstar' - a low-profile sedum that doesn't open up as it grows. It has blue-green foliage and salmon-pink flowers. The trial gardens manager says it is "a definite improvement over S. cauticola". It was un-phased in their trial gardens during an extra-hot and dry summer. Best pollinator-friendly perennial: Salvia nemorosa 'Bumbleberry'. Its easy to maintain since it has a naturally compact habit, but its still a vigorous grower. About 12" tall and will re-bloom if dead-headed. "We were wowed right away by the visuals of this plant, and once we got it into production, we continued to be impressed….It truly lives up to the PRIMO name of larger, vigorous plants." Glossy black foliage can make a container planting pop! Roy Diblik - "They share the space unselfishly"
He talked to us about Plant Communities, and somehow it ended up being about human communities as well. A plant community will thrive only if it has all the building blocks, including good soil and a diversity of plants to support a wide variety of insects. Living and dying roots are what regenerates the soil. "Remnant prairies" (untouched soil) have 18 - 24 species of plants per sq meter - all thriving and occupying their niches happily and benefitting each other. They share the space unselfishly. So it should be with human communities as well. You have to get to know the plants. It's not "fair" to the plant to ask it to do what you want it to do - you should find out what it wants to do and where it wants to be to thrive." P.S. this is how we should treat people as well! Turf and boxwood" landscapes have no pollinators, no birds. You don't need mulch, organic amendments, fish emulsion etc - Everything you need falls from the trees in autumn and all the soil needs is roots living and dying. You have to put a plant community together in a way that eliminates agricultural weeds. If you can reduce the light reaching the soil to below 1000 ft-candles (or better, below 200 ft-candles) then weed seeds won't germinate. Lurie Garden Chicago - the interplay of sun and shadow and the colors of the grasses, with the amsonia just beginning to turn its bright yellow autumn color, is mesmerizingly beautiful to me. Roy Diblik says: "Learn about 20 plants in depth, then gradually learn another 10 or 20 - that's all you'll need"
Words of wisdom: "Sedges give you the opportunity to outsmart weeds"
One plant he mentioned that I hadn't known was Gillenia trifoliata (also Porteranthus trifoliatus). Common name: Bowman's Root (Also known as Indian Physic or American Ipecac; sounds lovely!). Bowman's Root is an easy-to-grow native for bright shade or partial sun and it tolerates tree root competition well as long at it has a nice layer of organic mulch. 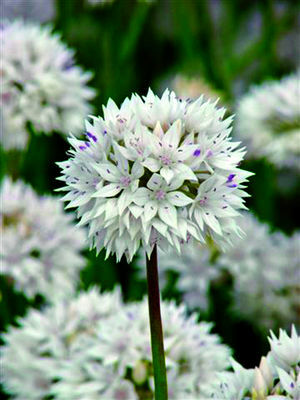 Bowman's Root is lovely in a mass planting where its lacy white flowers can shimmer in a light breeze. It makes a nice filler - think Gaura for shade! A compact, rounded plant, it is topped in late spring with ethereal white flowers growing in a few loose terminal panicles, with red petioles and mahogany stems. Clean, disease-free foliage often turns deep bronzy red in fall and contrasts beautifully with the more typical oranges and yellows in the perennial border. Interesting form and unique seed heads persist into winter. Great for cut flowers! Pierre Benerup, CEO of Sunny Border Nurseries is the person who came up with the idea of selling perennials in containers! Up till then perennials were sold mostly as bare root plants. 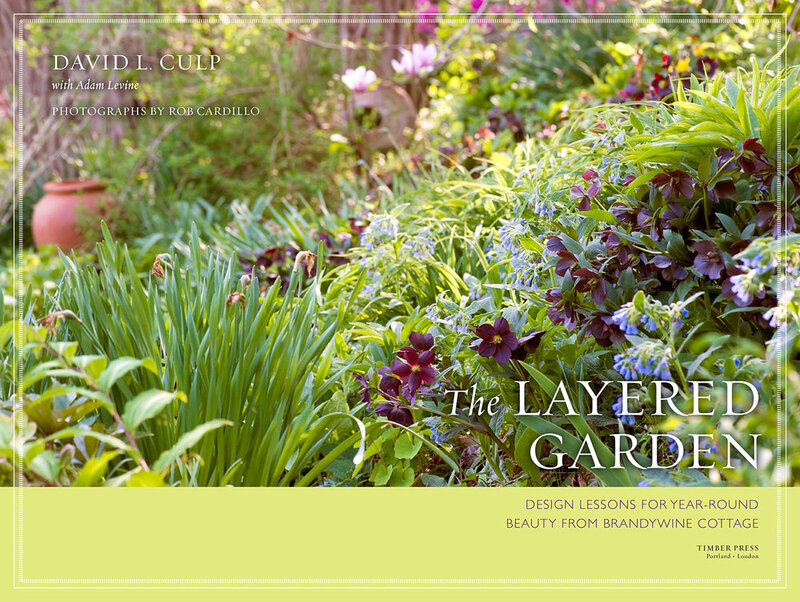 Like other perennial garden "greats" we know, like Piet Oudolf and Roy Diblik, Bennerup has a passion for plants and a wealth of hands-on learning. He also had a solid background in sales and marketing, which is how he decided to plant in containers - it was sheer practicality. In the early 1970s, perennial plants were primarily sold bareroot. Wholesale growers such as Walters Gardens in Zeeland, Michigan, and Springbrook Gardens in Mentor, Ohio, grew hundreds of acres of perennials in sandy soils and shipped nationwide to mail-order firms. In turn, the firms put their inventory into coolers until it was time to ship in spring and fall. Perennials such as moss phlox (Phlox subulata) and evergreen candytuft (Iberis sempervirens) were field-dug, thrown into two-quart wooden baskets, and placed on sale in retail nurseries, but few other perennials had the durability to withstand that kind of rough handling. In the '50s and '60s, Sunny Border had converted a large part of its operation to field-grown production of yews (Taxus media) in order to meet the huge demand for foundation plantings created by the boom in home construction following World War II. The soil in that area of Connecticut is a clay loam, ideal for producing balled-and-burlapped yews, but not for perennials, which couldn't be dug after rains as quickly and easily as they could in the sandy soils of Bennerup's bigger competitors. With the market for perennials expanding in the 1970s, Bennerup needed to come up with a solution. It was at this point that he decided to take the digging out of the equation and grow plants in pots. "I believe a good perennial garden is mostly foliage-various shades of green, bronze, silver, and gold. It's soothing. It's cooling." He adds, "Flower color in the garden should be savored in small portions like dessert. Too much color causes garden obesity." "Perennial gardening is about subtlety, form, fragrance, texture, calm, and sometimes even sound and motion; in fact, all the senses, not just sight," he says. "I get so much enjoyment from gardening and plants," he says. "It's such a great gratification. We are connecting with the real world." In addition to being a fan of perennials with interesting foliage, Pierre Bennerup says his favorite plant "tends to be whatever is blooming at the moment." He does admit to affinities to certain families or genera, such as the primrose family, the ranunculus family, the genus Epimedium, the genus Hakonechloa, the genus Saxifraga, and the genus Phlox. Here are some of his favorite individual perennials, including a few introductions by Sunny Border. … is planting spring-flowering bulbs. There are lots of bulbs that are not dug up and eaten by critters, with flowers that are not eaten by critters once they bloom. The tried-and-true are daffodils and alliums. Both of these types of bulbs naturalize and give a welcome early and later spring show. Plant daffodil bulbs in “bouquets”. Don’t plant bulbs in areas of the garden where the soil is too wet – they can rot if they sit in wet soil. Plant large alliums as punctuation marks in the garden, but make sure that they’re planted among other perennials that will hide the alliums’ yellowing foliage as it ages. The big lollypop alliums lose their foliage almost as soon as they flower. Don’t plant your bulbs too soon (or too late). Here’s where you need to know about “biological zero” – the temperature at which biological activity (including microbial growth processes) are stopped. In other words, the temperature of your refrigerator – cold enough to stop “things” from growing in your food – about 42 degrees F. It turns out that when the ground temperature gets below about 50 degrees F, roots can still grow, but shoots can’t. When the ground temperature gets below biological zero, nothing will grow, even though the ground isn’t frozen. The ideal for bulbs is that they grow roots after you plant them, but not shoots. That way, they’ve gotten a good solid start before the ground temperature reaches biological zero, but they haven’t started shoots that sap their energy stores and are vulnerable to damage by the first frost. So aim for planting your bulbs when the ground temperature at 6 – 10” below the surface (where the bulbs will be located) should be “just right” - usually sometime in mid-to-late November. Planting them “too late” (i.e. 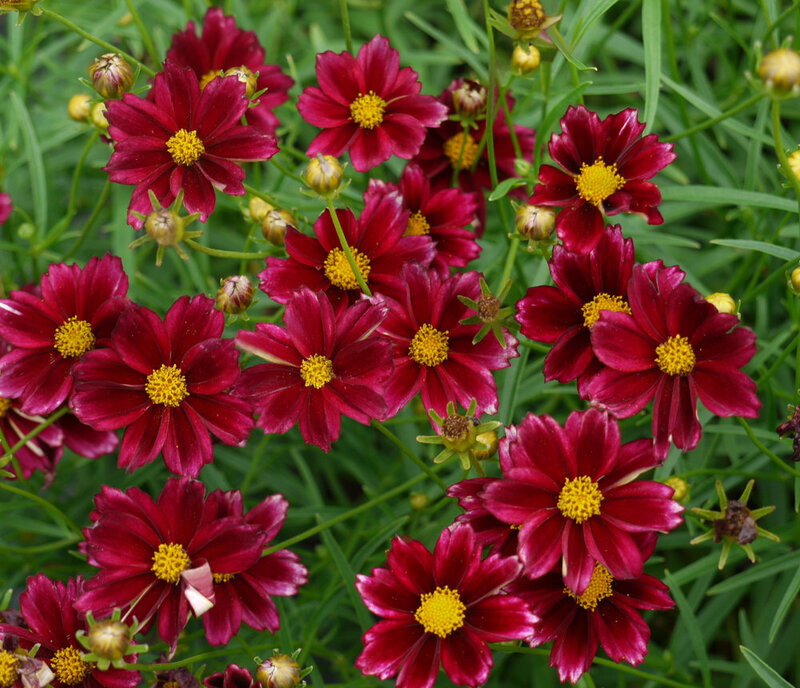 after the ground temperature is below 42 degrees F) is not optimal – but much preferable to not planting them at all! So go ahead and plant bulbs in December, as long as the ground is not frozen – you need to be able to plant them at the proper depth. 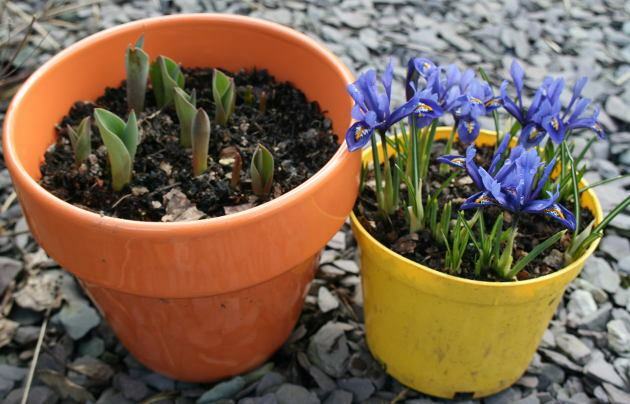 Plant bulbs in the weatherproof containers that you allow to overwinter outside. A small amount of work (since it’s a small space) can reward you with delightful flowers when spring comes – and tide the containers over until you’re ready to add your spring or summer flowers.